Traditionally, scientists thought that birds had a poor sense of smell. But recent studies have shown that some birds use their sense of smell to find food, find their way home, or choose nesting material -these are the nosy birds. Julie Hagelin is an ornithologist at Swathmore College in Pennsylvania. She wonders if birds also use smells to communicate. 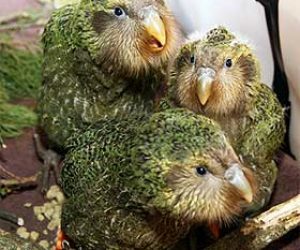 The idea came to her several years ago when she held an endangered New Zealand parrot – the kakapo. Julie Hagelin: Kakapos have an odor that I would describe as very sweet and almost lavender and honey like. Other people have described the odor as, it’s a very musty smell, and sort of the equivalent to the inside of a clarinet box. . . . But when I held this bird, I began to wonder whether or not these birds are actually communicating in other ways. What does nosy birds actually mean? Many birds wear flashy feathers or perform sophisticated songs to woo their mates. Perhaps they also use perfume. Julie Hagelin: So birds may be assessing each other not only by the visual aspects of their feathering but also by the signals that they are producing that are chemical signals. Right now, Hagelin studies crested auklets – birds that smell like tangerines — to see if they’re attracted to each other’s smells. The birds smell most strongly during the breeding season. Since the 1970s a range of studies have shown that many birds use their noses the same way that other animals do: to find food, navigate their way home, or choose nesting material. But other animals also use smell to communicate with one another, something that is largely unexplored in birds. The misconception that birds cannot smell persisted in part because of some unscientific experiments conducted by prominent 19th century bird artist John James Audubon. Audubon set up an experiment with vultures, where he hid a rotten carcass and left a fresh carcass nearby, in plain sight. He assumed that if vultures could smell, they would flock to the rotten carcass, even though it was hidden. So when the vultures landed on the fresh carcass, he assumed they couldn’t smell. What Audubon couldn’t have guessed is that some vultures actually prefer fresh meat, and that they were using their nose not only to find the carcasses, but also to assess which one might taste better! Julie Hagelin has been working in the field of avian olfaction since 1994. 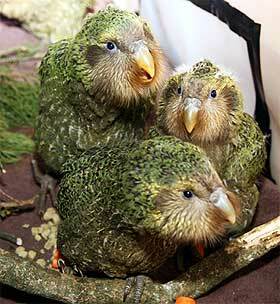 She first held a kakapo thirteen years ago, in 1989, when she was a sophomore in college. Hagelin began her work with crested auklets in 1999. Her auklet work is primarily in the field – in the gale-force winds and freezing temperatures of Alaska’s Buldir Island. Buldir, a steep-sided volcano surrounded by harrowing surf, is located at the end of the Aleutian chain. Here, Hagelin catches the auklets with a “noose carpet“, a grid of foot snares laid out on the rocks. Once caught, she takes the birds to a makeshift behavioral lab, a plywood shack perched on the talus slope. She tests the birds in a T-shaped maze to determine their preferences for different odors. Each bird begins in a start box at the bottom of the T. At the end of the T’s arms, Hagelin places an odor source and a control, both hidden from the birds view by an opaque screen. When the bird reaches the dead end, it must choose which way to turn, and where to spend its time. Hagelin has tested whether crested auklets spend more time near the smell of other crested auklets or near the smell of a related auklet species by using plucked feathers from each species. She has also examined if birds are attracted to the chemical components of the tangerine feather odor by recording whether birds spend more time next to a cotton ball soaked in a specific chemical found in the tangerine scent. Crested auklets engage in a courtship behavior called the “ruff sniff” display, where each bird places its beak in the nape feathers of the partner. The nape is an area that has a very strong tangerine scent, leading Hagelin to believe that this odor may serve as a pheromone for these birds. Keep your eyes peeled for details of her study, which is currently in press.